The Poets Inn, Porto, Portugalia : Rezerwuj teraz! Welcome to the romantic city of Porto - known for its unique Oporto Wine, impressive views of the Douro river, typical old districts and warm locals, always ready to help someone and make your stay unforgettable. Our INN its located 30 seconds from 'Torre dos Clerigos', Porto ex-Librium, 2 minutes from the metro, the bus and train station (Sao Bento), 2 minutes from Aliados, our 'living-room' to welcome all the travelers. With us you will enjoy our spacious rooms , key card acess, big windows and balconies, 2 lounge rooms with TV&DVD, a good movie and music selection, 1 guest kitchen with all the facilities, and free high-speed internet points (plus WI-Fi). 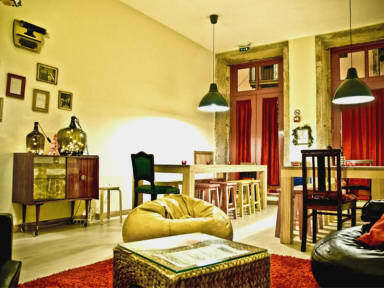 Book 5 nights in our 2 Hostels, through our website, in Lisbon and Porto, and get a 10% discount in the 2nd Hostel you are staying. Please note that the 1st night of your stay will be charged in case of No-Show. If you cancel your reservation after 12pm the day before, 50% of the 1st night will be charged. On the same day, we will charge the 1st night and 50% of the 2nd night.